Yesterday I asked my friends on Facebook one little question and the response I had was amazing! So incredibly helpful I’d feel selfish keeping it all for myself. 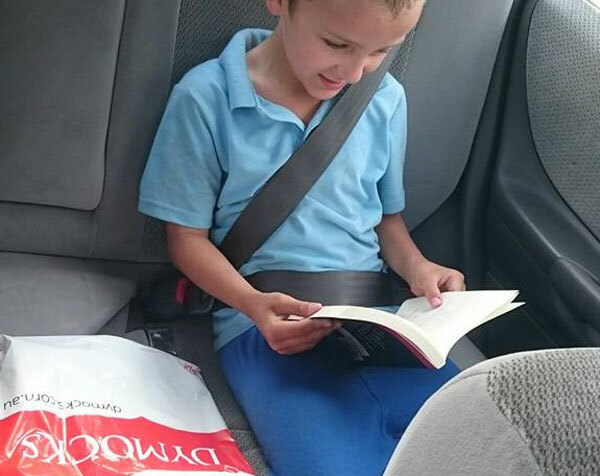 My 7 year old boy has very recently discovered he actually enjoys reading – pretty much only since the start of the summer holidays. He started with the 13 Story Tree House and quickly read through the whole 5 book series (and is eagerly waiting for the next installment due out in August). We explored a few other books by the same author – Andy Griffiths – my boy enjoyed reading “The Bad Book” and “The Cat On The Mat Is Flat” but he read these both in an afternoon. I then bought him “Just Tricking” but he found it a little bit tricky ( ‘scuse the pun) to read, though he’s enjoying having it read to him. The answers came fast and varied and by the end of the evening I had well over 20 books on the list (and MANY of these are book series, so there are WAY too many books recommended here to even count them). Several books received multiple endorsements and a few sparked a little debate as to whether it was for a new reader or if it was maybe a little bit advanced. So I can’t actually personally recommend many of these books as we haven’t read them ourselves, but I can vouch for the people who suggested them; they are parents of similar aged children and based their suggestions on what their children are reading or had read at my son’s reading level. I’m actually feeling a little bit overwhelmed as to where to event start to tackle this list!!! What books do your younger readers enjoy? My daughter (5) is loving The Magic Faraway Collection and The Wishing Chair at the moment. We read Charlie and the Chocolate Factory last year but I think it was too early for her, so later this year we might give more Roald Dahl books a go. Can’t wait to introduce her to The Mapmaker Chronicles and Tomorrow, When the War Began when she’s older. So many great suggestions! Thanks! My 4.5 yr old is almost ready for these, so better go stock up. My son loved a few of these. Zac Powers was a good series to keep him busy for a while (although not as long as I thought). My son is only four but I have to admit I am SO excited for when he’s ready to read (or even listen to) chapter books! I have fantasies of story time being this wonderful time where we take turns reading chapters to each other haha. This is a great list! Thank you. My nearly 7 year old daughter is reading the Big Book of Billy B Brown Volume 1. She loves it and is asking for Volume 2 already. And my 9 year old is currently reading a Secret Seven book but has read a few of the Roald Dahl ones. I am so relieved to see them reading when there are so many other (electronic) distractions competing for their time! I’ll definitely be referring to this list. Thanks for sharing. Visit your local library and speak to their children’s librarian, they’ll have a lot more suggestions. Or take your kids with you, let them loose, and see what they choose themselves. The beauty here is you don’t have to buy the book, so if it doesn’t work out, you haven’t wasted any cash. And if your child starts a book and don’t enjoy it, they don’t have to feel like they have to read it all. Remember you’re trying to encourage their love of reading, which won’t happen if they’re reading something purely out of the obligation of ‘if you start something, you should finish it’.